March 24, 2015 – At any given moment, our sun emits a range of light waves far more expansive than what our eyes alone can see: from visible light to extreme ultraviolet to soft and hard X-rays. Different wavelengths can have different effects at Earth and, what’s more, when observed and analyzed correctly, those wavelengths can provide scientists with information about events on the sun. In 2012 and 2013, a detector was launched on a sounding rocket for a 15 minute trip to look at a range of sunlight previously not well-observed: soft X-rays. Each wavelength of light from the sun inherently carries information about the kind of process that emitted the light, so looking at soft X-rays provides a new way to figure out what is happening on our closest star. For example, the sun’s atmosphere, the corona, is 1,000 times hotter than its surface, and scientists do not yet understand the details of why. The soft X-ray detector brought home data showing that a significant amount of soft X-rays – more than expected – were seen when there are even a small amount of magnetically complex sunspots. Identifying what process within these magnetically active regions contributes to the great increase in soft X-rays could hold clues for what’s helping to heat the corona. A paper on these results appeared in the Astrophysical Journal Letters on March 18, 2015. This soft X-ray detector hitched a ride into space on a NASA sounding rocket. During a 15 minute total flight, sounding rockets have about six minutes of time to gather data from space. The soft X-ray detector and its related components are only about the size of a pack of cards, so it could easily fly on board a rocket carrying another experiment – in this case, one that helps calibrate the Extreme Ultraviolet Variability Experiment, or EVE, on NASA’s Solar Dynamics Observatory. Sounding rockets and combining missions on a single launch vehicle provide an opportunity to conduct world-class science with a lower price tag. The soft X-ray detector flew first on June 23, 2012, and again on October 21, 2013. During both flights, there were only a few complex active regions on the sun’s surface – indeed, very few during the 2012 flight. Yet, in both flights the detector saw 1000 times more soft X-rays than had been seen by another experiment in 2009. Even a slight extra amount of solar activity in the form of these active regions, led to substantially more output in the soft X-ray wavelengths. Wavelengths of light correlate to particular temperatures of material on the sun, and this abundance of soft X-rays points to clouds of hot – 5 to 10 million degrees – gases above the active regions that wasn’t present during the 2009 measurements when there were no active regions on the sun. That kind of information makes it clear that different heating mechanisms occur on the quiet sun and active regions, opening the door to determining the differences. One theory for the source of this mysterious heating is that numerous tiny explosions called nanoflares are constantly erupting on the sun. Nanoflares are too small to be seen by our telescopes, but powerfully energetic nonetheless. The soft X-rays might well be a result of nanoflares, thus giving us a way of investigating them. The new soft X-ray data differed from previous data studies in another respect as well. By parsing out the amounts of each individual wavelength of light gathered, the team could identify what elements were present in the corona. Typically, the abundance of some of these atoms in the corona is greater than at the sun’s surface. But not so in these recent observations. The mix of material in the corona was more similar to the mix seen at the solar surface, suggesting that some material from the surface was somehow rising up higher into the atmosphere. “The difference we see in the abundances of the elements compared to previous studies suggest there may be a link between the heating mechanism and the coronal composition,” said Caspi. Untangling the elements present on the sun’s surface and in its atmosphere during different events on the sun could offer another set of tools for interpreting what heats the corona. Discovering that the soft X-ray emission was brighter than supposed has effects for understanding space weather events near Earth as well. Different wavelengths of light from the sun penetrate to different layers of Earth’s atmosphere, causing different effects. Such changes in the ionosphere happen during large explosions on the sun called solar flares. As humans attempt to better understand – and predict – the sun’s effects on the space through which our communication signals travel, it’s crucial that we have accurate models to simulate what the sun is sending our way and when. The soft X-ray detector used for this experiment was an Amptek X123-SDD and the results so far are based on what amounts to only 10 minutes worth of data. However, this early data clearly shows the value of observing the previously understudied soft X-ray emissions. In the hopes of getting a longer data record, LASP is currently building and testing a NASA-funded Cubesat that will monitor soft X-ray emissions from the sun and allow scientists to better understand how the incoming radiation impacts Earth’s ionosphere, thermosphere, and mesosphere. The Miniature X-ray Solar Spectrometer (MinXSS) is a 4-year, ~$1 million project to design, build, integrate, test, and operate a 30cm x 10cm x 10cm satellite that will be launched to the International Space Station in April 2015. The MinXSS project heavily involves graduate student team members with scientists and engineers at the University of Colorado Boulder and LASP. Over 40 graduate students have worked on the MinXSS project. MinXSS is part of NASA’s CubeSat program, which started in October 2013. MinXSS will provide 6-12 months of observations to advance our understanding of soft-X-ray emissions from the sun both from solar flares and during quiescent periods. 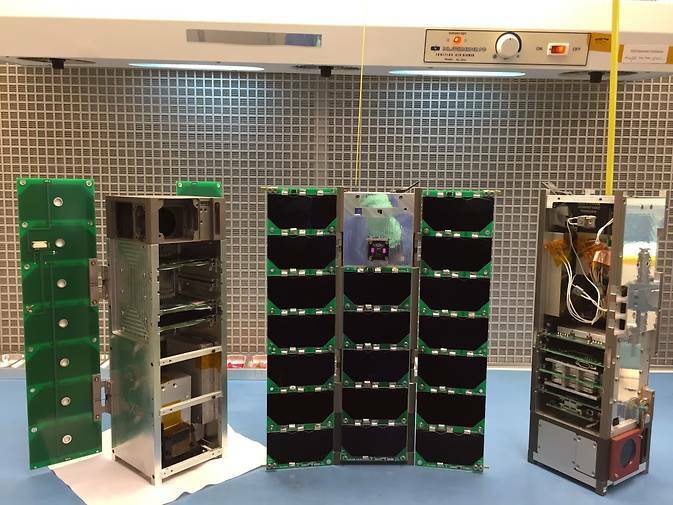 CubeSats are small satellites that ride along with larger missions to take advantage of yet another low cost way to perform experiments in space.